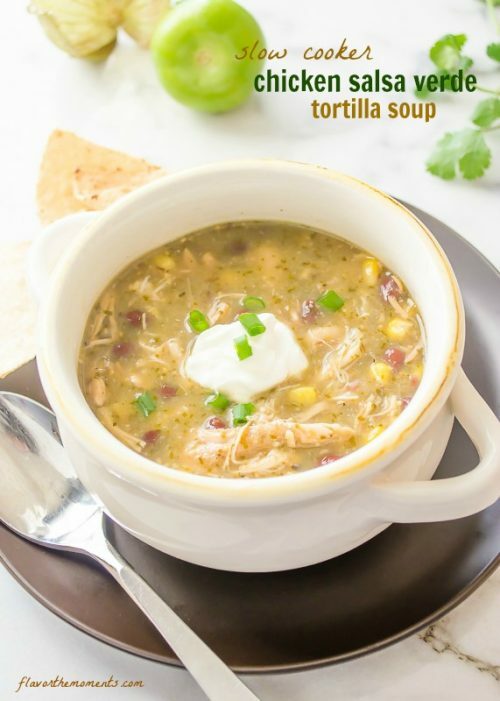 Slow Cooker Chicken Salsa Verde Tortilla Soup is classic chicken tortilla soup with a salsa verde twist! It's healthy, hearty, and delicious! 1 lb. tomatillos, husks removed and rinsed (halve them if they're large, or leave whole if they're small). Preheat the broiler. Toss the tomatillos, onion, garlic, and jalapeño in the canola oil and place on a large rimmed baking sheet. Broil for 10 minutes until nicely charred. If the tomatillos are large, they may need another 2 minutes or so under the broiler. Place the vegetables in a food processor, and add the ½ cup cilantro, water, lime juice, sugar, cornstarch, salt and pepper. Process until as smooth as possible. Taste for seasoning and add more salt, pepper, or lime juice if necessary. Season the chicken breasts with salt and pepper and set aside. Place the salsa verde in the slow cooker, and stir in the chicken stock. Add salt and pepper, to taste. Stir in the black beans and corn, then add the chicken. Cover and cook on low heat for 4 hours or until the chicken is cooked through. Remove the chicken from the slow cooker and shred, then stir the shredded chicken into the soup. Ladle into bowls and serve with Greek yogurt or sour cream, and tortilla chips. Enjoy! If you like your soups on the thin side, add more chicken stock. If you're short on time and would rather just use store bought salsa verde, you will need about 2 cups. Salsa verde can be made ahead and frozen until ready to use.